The following is a brief recap of the Tues., Nov. 21, 2017, BPS101 Regular Board Meeting. View recap of Tues., Oct. 17 Board Meeting. Board members celebrated Batavia High School student Robert Finch who, along with his teammates from the Fox Valley Special Recreation Association, won a gold medal at the Oct. 29, 2017, Special Olympics Illinois Division 6 championship volleyball game. During the celebration, BPS101 Assistant Director of Student Services Kari Ruh and BHS Math Teacher and Freshman Football Coach Mike Theriault shared how Robert continues to make a positive impact at BPS101 and is the team manager for the Batavia High School Freshmen Football Team. 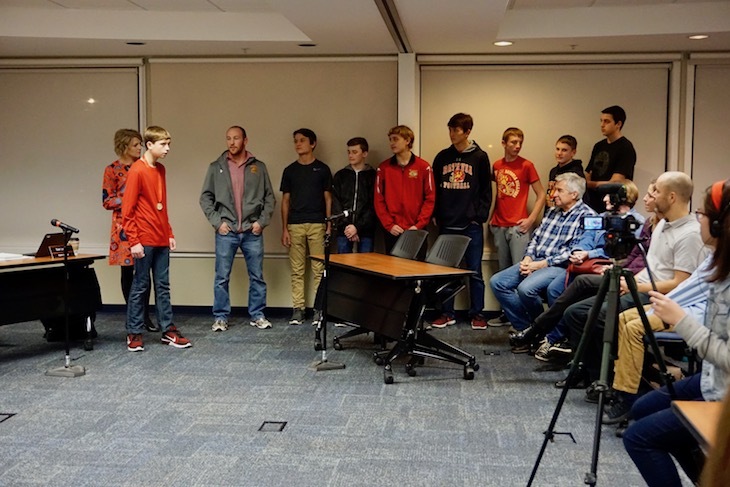 Members of the freshmen football team came in support of their beloved manager and stood with him during the presentation. It was a really special moment! AGS students are now podcasting to share what’s happening in Gator Country! 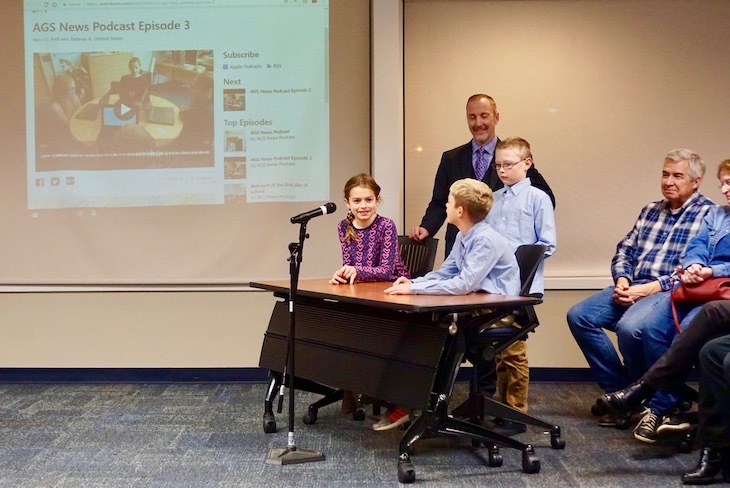 In celebration, AGS Principal Dr. Tim McDemott, invited three AGS podcasters, Charlotte Johansen, Tommy Jensen, and Nathan Donosky, to the Board Meeting to share their experience with producing weekly podcasts. Tune into the AGS podcasts on AudiBoom. Dr. Brad Newkirk, BPS101 Chief Academic Officer, presented a draft of the 2018-19 school calendar to the Board and explained that it was created based on feedback from parents, staff, and partner schools and organizations. Board Member Tina Bleakley asked why school is slated to start on August 15, 2018. Dr. Newkirk explained that it is because BPS101 is on the collegiate calendar and to ensure high school students complete finals before winter break. The draft calendar is also closely aligned with the John C. Dunham STEM Partnership School. A final calendar recommendation will be brought to the Board at the next Regular Board Meeting on December 19, 2017, for approval. In accordance with the monitoring responsibility built into “policy 6:17 Title 1 Program,” Dr. Newkirk provided Board Members with this report on BPS101 Title 1 schools. Title I qualification is based up on the percentage of low-income enrollment at each building. In the 2016-17 school year, four of eight BPS101 schools (H.C. Storm, Hoover-Wood, J.B. Nelson, and Rotolo Middle School) qualified for the Title I program, and more than 350 BPS101 students and families at these schools were supported through Title I funding. Tues., Dec. 19, 7 p.m.
Tues., Jan. 23, 7 p.m.